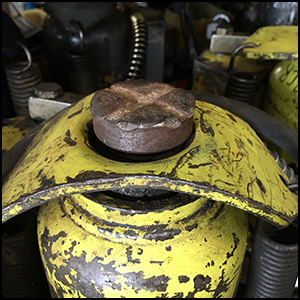 “Why Does My Axle Jack or Air/Bottle Jack Fail Prematurely?” If you’re asking this question, don’t question your sanity, you’re not the only one! This is one of the most common questions we receive from customers and nine times out of ten, there’s a simple and easy solutions. WHAT ARE THE MOST COMMON PROBLEMS WITH THESE STYLE JACKS? 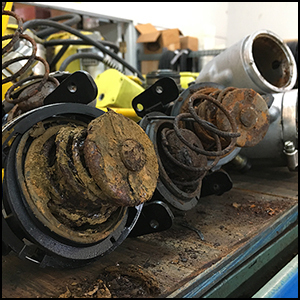 This issue can be minimized with some preventative maintenance suggestions. Drain compressor tanks daily or as needed. 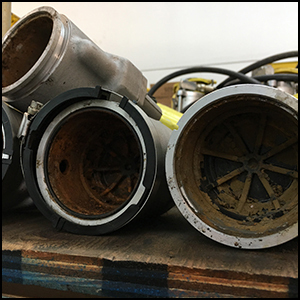 (see examples below) This will help lessen contamination in the air motor which can cause the air motor to run sluggish or not at all and eventually rust over. Lubricate the air motor. This can be done by adding your lubrication of choice into the air actuator trigger (just a few drops) before you use the jack each day. (See example below). 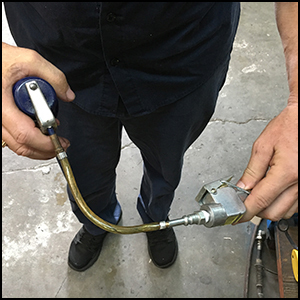 This will lubricate the air motor piston and cylinder walls for smooth oscillation and it will help keep water off of the metal parts in the air motor which can cause rust. The issue I would like to bring to light is Point Loading. A point load happens when the load shifts from the center of the lifting pad to an outer edge. This will cause damage to the lifting pad (See Example) and also cause internal damage to the hydraulic cylinder walls and piston rod base (See figures 4 and 5). 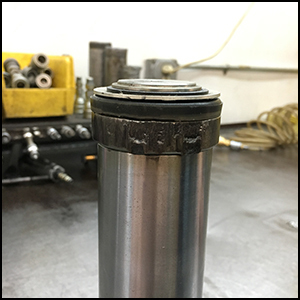 If you have had a jack piston rod that won’t retract you are more than likely experiencing a point load problem. Damage occurs mostly when the jacks are used to support the load throughout the job. When this happens you will increase the chance of a point load dramatically. It’s important to note that any type of jacks without a locking collar are designed to lift and lower the load only. It is highly recommended that jack stands with corresponding tonnage capacities be used to sustain the load throughout the job. It will extend the life of the jack and more importantly keep the service tech out of harm’s way. Andy Mathys has well over twenty-five years of experience at ESCO –Equipment Supply Company, handling customer service and technical related enquiries. 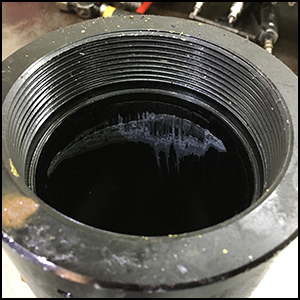 Mr. Mathys spend a good portion of his employment at ESCO, in the repair and diagnosing of hydraulic equipment. Andy currently serves as ESCO’s technical advisor along with assisting in day-to-day customer service activities. To get in touch with Andy Mathys regarding product or technical advice on ESCO Product, please email AMathys@esco.net or call 352-754-1117.